Kelly Flanagan is a psychologist, father, and blogger who is best known for the letters he has written to his children on his blog, one of which landed him on the Today Show with his four-year-old daughter. 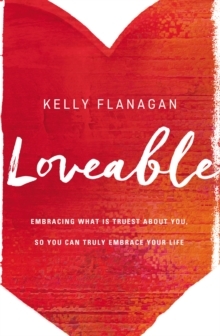 In Loveable, Flanagan answers three fundamental human questions: Am I enough? How do I become unlonely? Do I matter? He shows us how to rediscover our worthiness and remember that we are good enough. He encourages us to shed the false self that keeps us lonely and to find people who accept us as we are. And he inspires us to fully embrace our passions, regardless of how ordinary those passions may be. Reading like an extended love letter to readers, Loveable uncovers three essential truths: you are enough, you are not alone, and you matter. Flanagan invites us to disconnect from the distractions and demands of daily life and to listen more intently for the voice of grace within each of us, so we might fully awaken to the redemptive story we are here to live.